Surveys and socio-professional studies carried out at national and international levels \contribute to a better understanding of the lighting retrofit process. 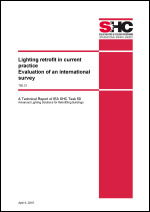 Within the framework of the International Energy Agency Task 50 - Advanced lighting solutions for retrofitting buildings- and its subtask C1 focusing on the analysis of workflows and needs, an online survey on lighting retrofit was initiated in December 2013. After 9 months, more than 1000 answers were collected. The survey provides clear insights about the workflow of building professionals and leads to a better understanding of their needs in terms of computer method and tools. One of the main outcomes of the survey is that retrofittig strategies used in practice essentially focus on electric lighting actions such as of luminaires replacement and the use of controls. Generally, daylighting strategies are not rated as the highest priority. The results also indicate that practitioners mainly rely on their own experience and rarely involve external consultants in the lighting retrofit process. Furthermore, the survey results suggest that practitioners are interested in user-friendly tools allowing quick evaluations of their project, with a good compromise between cost and accuracy, and producing reports that can be directly presented to their client. The survey also emphasized that the main barriers in using simulation tools are essentially their complexity and the amount of time it takes to perform a study. Practitioners are keen to use tools at preliminary design stage and would like to be able to estimate the cost and other key figures (energy consumption and lighting levels). The paper concludes with recommendations for the building software developers to address the needs of practitioners in a more suitable way. This document proposes a state-of-the art review of the existing method and tools available on the market for practitioners. As starting point, the most used software were taken from the survey realised within C1, and those were categorised in four categories: 1) Facility management tools (global diagnostic tool including economic aspects) 2) Computer-assisted architectural drawing / Computer-aided design tools 3) Visualization tools 4) Simulation tools The third category regarding the visualisation tools contains a warning for the practitioners, as they are not providing tangible results in terms of physical numbers. In total 20 software were described, and their main features compared in a table for a quick reference. Furthermore, the simulation tools were assessed using a case-study of a school refurbishment. Equivalent information given to practitioners was used to define the properties of the room (2D plans and photometric properties). Simulation experts were asked to simulate for daylight the daylight factor and for electric lighting the work plane illuminance. Results indicate a rather large dispersion for daylighting results between the different tools, even though the case-study was described with great care. However, on electric lighting the results remain within 10-15% range from the median value. The obtained results indicate that practitioners can rely on electric consumption computed by the tools during night time, but that the combination of daylight and electric light remains a challenge for simulation tools. 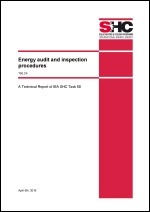 This document consists of three parts dealing with energy audit and inspection procedures The first section (2.1: Daylight performance assessment methods), deals with the description of the different metrics available to evaluate the daylight contribution. These metrics are distinguished in two categories: Daylight availability metrics and daylight glare metrics. For each of them, a short description is given, followed by an example. Then comes a paragraph describing the boundaries of the metric and some references. The topic of the second section (2.2 Investigation of energy monitoring procedures for electric lighting systems) is addressed in detail within the framework of subtask D (Casestudies). This chapter does not intend to report on this work, but simply focuses on the presentation of a “flash” analysis method used in Switzerland to assess the lighting status of existing buildings. This simple method, based on a quick tour of the building, is used as a kind of checklist. Insofar as it does not include detailed monitoring (only a few punctual illuminance measurements) it does not intend to draw a detailed view of the situation but aims to identify the potential actions for lighting refurbishment. In the third section (2.3 Benchmark on case-study) we show, for the different metrics, the results obtained by the simulation tools described in C-2 document. The case study corresponds to the “After Refurbishment” situation described in C2 document (cf. C2.6.1 Description of the case study for lighting simulations). The document reflects a study about the so called “advanced and future simulation tools”. The denominated software is able to simulate Complex Fenestration Systems (CFS) which are composed of solar shading and daylight redirection systems. Those systems might have complex light transmission properties named Bidirectional Transmission Distribution Functions (BTDF) that can be monitored using gonio-photometers or simulated using raytracing tools. Five tools able to simulate CFS were examined in a variant of the refurbished case study of C2. Four kinds of CFS were considered, ranging from clear glass to lasercut panel, and were benchmarked with daylight factor values on the work plane and renderings in sunny conditions. The results showed a large discrepancy in the results for the daylight factor values, indicating the difficulty to simulate daylight likewise in the document C2. The renderings with sunny conditions let the user of the tools appreciate the deviation effect of the lasercut panel for instance, but the obtained images are bound to the intrinsic resolution of the monitored BTDF which may be coarse depending on the source of data. The advanced and future simulation tools can give an interesting indication of the light distribution through CFS, but practitioners should remain aware of the limits of the method using monitored data bound to a defined resolution. The results are satisfactory enough to get an idea of illuminance profiles or even heat transmission, but not for tasks that require a precise luminance distribution such as glare index calculation.